If you travel to the Pacific islands one of the native foods you would have the pleasure to enjoy is coconut water, also referred to as coconut juice. Coconut water is the liquid you find inside the coconut. It is the most popular beverage consumed in the tropics. Here it is not only considered a refreshing beverage but a health tonic. Women are encouraged to drink it when pregnant and nursing so their milk will provide all the nutrients necessary for a healthy baby. The first food an infant receives as it begins weaning is coconut water and coconut jelly (soft immature coconut meat). Hawaiians call coconut water noelani (no-way lah-nee), which means “dew from the heavens.” Coconut water has a long history of use as both a food and as a medicine. Although a variety of fruits grow in abundance in many tropical locations, coconut water is prized above all other juices and beverages as a means to quench ones thirst and bring relief from the hot tropical sun. It not only satisfies thirst but invigorates the body and brings about a sense of well-being and renewed health. Coconut water contains a variety of nutrients including vitamins, minerals, antioxidants, amino acids, enzymes, growth factors, and other phytonutrients. Since coconuts are grown near the sea, the roots have access to a continual supply of mineral rich salt water. These minerals are absorbed by the roots and find their way into the fruit of the coconut. For this reason, coconut water is a good source of the major minerals like magnesium, calcium, and potassium. It is particularly rich in potassium, an essential nutrient; one 8-ounce cup of coconut water has more potassium than a banana. It also contains a variety of trace elements such as zinc, selenium, iodine, sulfur, manganese, boron, molybdenum, and others. All derived from volcanic soils and seawater from which the coconut palms are grown. All of these minerals are in the form of electrolytes so they are easily absorbable by the human body. Many of the health benefits attributed to coconut water can be traced to its mineral content. The fat content of coconut water is so low, it is essentially fat-free. Coconut water is relatively low in sugar compared to other fruit juices. It contains only a fifth of the sugar that you get from an equal amount of fresh grape or apple juice. Even though it is low in sugar, it has a mildly sweet, delightful taste, making it an excellent alternative to fruit juice and sodas. It has long been the belief that coconut water can cure disease and ensure good health. According to tradition, coconut water is useful in preventing and relieving many health problems including dehydration, constipation, digestive disturbances, malnutrition, fatigue, heatstroke, boils, diarrhea, kidney stones, osteoporosis, urinary tract infections, and sterility. Whenever someone is sick, coconut water is usually part of the treatment to nourish the patient back to health. Interestingly, modern medical science is now confirming the effectiveness of coconut water for many of these conditions. The greatest amount of research to date on coconut water has been in regard to its effectiveness in treating dehydration and heatstroke. In the tropics where heatstroke and dehydration are common problems, it has long been known that coconut water is far more effective in relieving symptoms associated with these conditions than either plain water or fruit juice. Because of the nutritional content of coconut water, fluids and electrolytes are absorbed quicker and more efficiently into the bloodstream than with other beverages and fluids. It is so effective at relieving dehydration and heatstroke it has been dubbed “Nature’s Gatorade.” However, coconut water is far superior to Gatorade. Coconut water contains more essential electrolytes, less sugar, and does not have any of the chemical additives found in commercial sports drinks. Much of the popularity surrounding coconut water currently is in regard to it being marketed as a natural sports drink. The effectiveness of coconut water to hydrate the body has been proven over the past two decades where it has been used extensively as a treatment for cholera, dysentery, influenza, and other infectious diseases that promote dehydration. Coconut water has literally saved thousands of lives, especially of children in underdeveloped countries. Ordinary water is not effective in treating sever dehydration caused by vomiting and diarrhea, but because of coconut water’s unique chemical composition it is able to rehydrate the body and give it the strength and energy it needs to fight off the infection. Death rates from cholera are high, but with the use of coconut water survival rates increase to 97 percent. In Jamaica coconut water is known as a heart tonic and is used to strengthen the heart and improve circulation. Research bears this out. Animal studies show that coconut water consumption improves the ratio of good cholesterol to bad and reduces plaque formation in arteries, thus reducing risk of heart attack and stroke. Because coconut water improves blood circulation, it is of benefit to diabetics. One of the characteristics of diabetes is poor circulation and a tendency to develop atherosclerosis. Many of the complications associated with diabetes, such as numbness in the feet, loss of vision, and kidney failure are a consequence of poor circulation. Coconut water helps dilate bloods vessels, improves blood flow, and reduces plaque formation, thus helping to relieve these symptoms. Coconut water also contains certain forms of dietary fiber and amino acids that help moderate sugar absorption and improve insulin sensitivity. Some of the most interesting components of coconut water are the plant growth hormones, particularly cytokinins. Cytokinins are a group of hormones that regulate growth, development, and aging. In some respects they are similar to human hormones with a similar name of cytokines. Cytokinins are also known as anti-aging hormones. Cytokinins regulate cell division and influence the rate at which plants age. Depending on the amount of cytokinins present, the aging process in plants can be either accelerated or retarded. One of the active sites of cytokinin production is in the roots. From here the hormone is carried by the sap throughout the plant—much like our bloodstream disperses hormones. Portions of plants that are deprived of cytokinins age faster than normal, Conversely, if additional cytokinins are added to a plant, normal aging is retarded. Cytokinins also have an anti-aging effect on human cells and tissues. Normal human cells, as they age, go through a progressive and irreversible accumulation of changes until they reach a stage at which they finally die. Young cells are plump, round, and smooth. As they age they become irregular in shape, flatten out, enlarge, and fill up with debris; cell division slows down and eventually stops, which is ultimately followed by death. When cytokinins are added to the culture medium, cells don’t act their age. The normal sequence of aging slows down considerably. Cells do not undergo the severe degenerative changes that ordinarily occur.5 Although the total lifespan of human cells is not increased much, the cells remain significantly more youthful and functional throughout their lifetime. For example, treated cells after they have reached the final stage of their lifespan and no longer divide, look and function like untreated cells half their age. Treated cells never undergo the severe degenerative changes experienced by untreated cells. In all respects, their youth is extended into old age. Because of their effects on human cells, cytokinins have been tested for the possible treatment for aging spots, wrinkles, sagging, and dry skin. One of the factors that cause wrinkles and sagging skin is the aging and breakdown of connective tissues in the skin. Connective tissues give the skin strength and elasticity. When cytokinins are applied to the skin, they stimulate cell division of connective tissue which replaces older, damaged tissue with functionally younger tissue. The result is that on the surface of the skin, wrinkles tend to flatten out. Dry, aging skin is replaced with smoother, softer skin. This has led some cosmetic manufacturers to add cytokinins to facial creams and lotions. Coconut water is the richest natural dietary source of cytokinins. Researchers have suggested the possibility that consuming a rich source of cytokinins, such as coconut water, may produce an anti-aging effect on the body, reducing risk of developing degenerative and age related diseases. The health benefits associated with coconut water are many. This article has only touched the surface. For a more complete description along with summaries of medical studies, case histories, news and historical accounts, and references, I suggest reading my book Coconut Water for Health and Healing. In the meantime, where can you get coconut water? While fresh coconuts are a common sight in the tropics, they can be hard to find elsewhere. At the grocery store you can find the brown, hairy coconuts sold in the produce section, but I don’t recommend those if you are looking for coconut water. These coconuts are too mature and the water can be sour. In the tropics people don’t drink this water, they drink “young” coconut water. Young coconut water comes from green or immature coconuts. This is the water you see vacationers drinking on the beach, this is the water that is popular in the tropics, this is the water that has the health benefits I’ve been discussing. Young coconuts are available at many health food stores and at Asian markets. But they don’t look like the brown, hairy ones with which you may be familiar. When a coconut is freshly harvested from the tree it is covered in a thick fibrous husk. This husk is usually removed before it is shipped to market, so you never see the husk, just the hard brown shell. Young coconuts, however, have only a portion of the husk cut off, leaving about an inch covering the shell. The husk is white and often shaped like a large toy top, with a point on one end and flat on the other. They are perishable so you will find them in the refrigerated section of the store. With the growing popularity of young coconut water, you can now get it in easy-to-carry bottles, cans, and tetra paks. They are available at most good health food stores and some grocery stores. 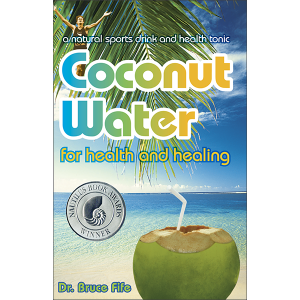 For more information or to order the book Coconut Water for Health and Healing click here. 1. Macalalag, E.V. and Macalalag, A.L. Bukolysis: young coconut water renoclysis for urinary stone dissolution. Int Surg 1987;72:247. 2. Alleyne, T., et al. The control of hypertension by use of coconut water and mauby: two tropical food drinks. West Indian Med J 2005;54:3-8. 3. Shah, N.J., et al. Use of coco-nut water in treatment of congestive cardiac failure. Ind Jour Med Res 1956;44:341-351. 5. Rattan, S.I.S. and Clark, B.F.C. Kinetin delays the onset of ageing characteristics in human fibroblasts. Biochem Biophys Res 1994;201:665-672. 6. Adair, W.L. and Brennan, S.L. The role of N-6-isopentenyl adenine in tumor cell growth. Biochem Biophys Res Commun 1986;137:208-214. 7. Dolezal, K, et al. Preparation and biological activity of 6-benzylaminopurine derivatives in plants and human cancer cells. Bioorg Med Chem 2006;14:875-874.